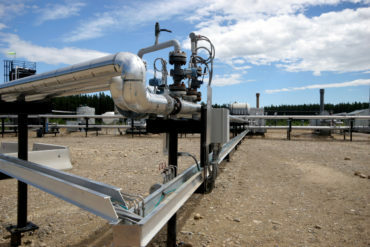 A $24.3-million lawsuit by an oil and gas company against a contractor over an accident that spilled 60 cubic metres of oil is one of Canada’s largest-ever subrogated claims, a lawyer for the plaintiff says. In ISH Energy Ltd v Weber Contract Services Inc., Justice Gillian Marriott of the Court of Queen’s Bench of Alberta ruled that Kerrobert, Sask.-based Weber was negligent and in breach of contract. ISH made a claim on its pollution policy after a spill was discovered July 17, 2007. “I believe this is one of the largest ever subrogation trial awards in Canada,” WeirFoulds lawyer Raj Datt, who represented ISH, told Canadian Underwriter last week. Datt said Friday his client did not want the name of the insurer disclosed to the media. ISH owns an oil field, pipelines and facilities near Fort Nelson, B.C. From the source wells, an emulsion – a mix of crude oil, gas and water – flows through a series of pipelines to a plant that separates the oil from the water. Pigs are devices that scrape the interior walls of the pipeline to remove deposits that are stuck there. A consultant for ISH described six different types of pigs to the court. For example, ball pigs are round objects while ribbed pigs – intended to create a seal in the interior as they move down the pipe – have ribs in the front and a cup area in the back. On July 6, 2017 a pig was put into the main line from a pig launcher located upstream from the plant. That pig got stuck and workers introduced 200 pounds per square inch of pressure from a gas well. A spill was discovered the following day. Pollution clean-up was done between that time and November 2007. ISH sued Weber for negligence and breach of contract. Justice Marriott ruled against Weber in her decision released March 28. ISH was awarded a total of $24,372,897.87 – $10,712,197.49 for pollution clean-up and $13,660,700.38 for repairs to the oil field. The parties disagreed on some of the facts. Much of Justice Marriott’s 41-page ruling focussed on expert reports on samples of pipelines analyzed after the accident, Weber’s contract and how Weber operators used pigs to maintain the lines. ISH argued leaks were caused by a high-pressure event July 16 2007. But Weber countered that ISH made its argument only to ensure the leaks were covered by the insurance policy. Weber’s theory was that for all leaks to be cover as one incident, a sudden event was needed and that had to be reported within 30 days. Judge Marriott was not convinced by Weber that over-pressure allegations were developed for purpose of securing insurance coverage. This finding was based in large part on expert witnesses called by ISH. Justice Marriott found that Weber was in breach of contract. The pigging was done but not as frequently as required by the contract, she ruled. She also found that Weber did not sufficiently treat the pipelines with corrosion inhibitor. The written record of pigging in the plant log books suggest that pigging was rarely done. Some witnesses testified that Weber complied with the pigging schedule. There were inconsistencies among witnesses as to the use of the plant log book and pigging activities. Justice Marriott found the witnesses were not dishonest but rather inattentive to keeping records and did not always remember details. ISH argued that a high-pressure event was caused when a Weber operator pinched or closed an inlet valve to regulate flow into the plant on July 16. This, ISH said, was done after a pig had been stuck and allowed excessive pressure to build up. ISH relied on circumstantial evidence that that valve was closed. Justice Marriott concluded a valve as closed and this led to trapped pressure between the stuck pig and the plant. The judge was convinced, on a balance of probabilities, that one of the Weber operators at the time had closed the inlet valve.